2011 Creative Challenge Punmu Montage from AWESOME Arts on Vimeo. Check out this video created by my fellow AWESOME Artist, Jarrad Seng, during our stay in Punmu, a remote community in the north west of Australia. We were guests of the community for 2-weeks as part of the AWESOME Arts 2011 Creative Challenge ’15 Minutes of Fame’ Project. We worked on using video & photography to capture stories about the famous places in and around Punmu. As we will be leaving Australia in June 2012, this will be my last residency with AWESOME Arts. Over the last 5 years, I’ve visited so many amazing places and worked with some very special bright young things! Enjoy the video, it’s truly beautiful and really captures the lovely spirit of all the kids and teachers we had the pleasure of working with during our 2-week stay in Punmu! ’15 Minutes of Fame’ currently has a collaborative exhibition of all 14 residencies from the past year as part of the AWESOME International Arts Festival for Bright Young Things. The exhibition is being held at the 140 William Complex beside the Perth Underground Station. If you live in Perth, please stop by to check out all the amazing work from the past year! The festival runs until Sunday November 27th, so you’ve still got time left. To check out other exhibitions and shows happening as part of the festival click here for a sneak peek of the works from the last few days of the festival. Also here is a link to an article in the Pilbara Echo about the residency. What can I say, I’m an AWESOME girl and therefore I can’t wait to share the 2010 AWESOME Program with the world! Check out this fantastic Festival Reel for a taste of what’s to come…you’ll recognize the music as the single, D.I.L, from my good friends, The Voltaire Twins! The AWESOME International Arts Festival for Bright Young Things boasts an awe-inspiring line up for 2010, showcasing amazing artists from the Netherlands, United Kingdom, USA, Australia and of course, the best from the West. The 2010 AWESOME Festival is on in the Perth CBD from 19 – 28 November and is a must see-do-experience event! Many events are free and are suitable for the young and the young at heart! For more information on the full program visit www.awesomearts.com or call (08) 9485 0560. Our last concert in the 2010 PEET Young Artist Concert Series is approaching very soon! 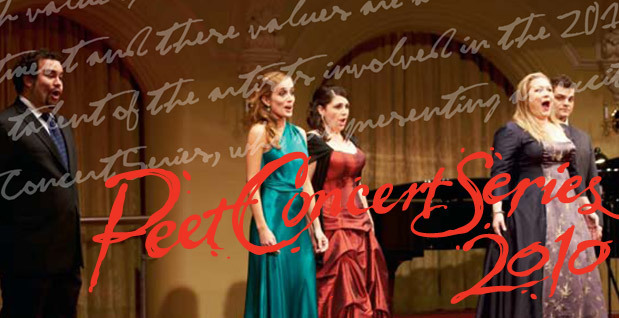 If you love Opera, you won’t be disappointed with the classic arias, duets and scenes we have in store in this concert. If you have never listened to Opera, this is a perfect introduction with lots of beautiful melodies and interesting story lines to keep you entertained! The talented young singers for the evening include soprano Jennifer Barrington, mezzo sopranos Ileana Rinaldi and Louise Fenbury as well as baritones Sitiveni Talei, Christopher Lewis and tenor Matthew Ward. Piano accompanist for the evening will be the fantastic, Tommaso Pollio. I am very excited that we will have Simon Kenway across as guest Music Director for the concert, Simon and I last worked together on The Elixir of Love, for Opera in the Park 2009! I’m looking forward to be directing the show and hope that anyone in the Perth area that is free will come join us at the beautiful Government House Ballroom for the evening. Virtuosic writing for the voice will be on show tonight in arias, scenes and ensembles that will shatter the crystal. Click here to purchase through BOCS Ticketing.